The UFT/Unity leadership's prime directive is to hold onto power at any cost. Understanding this basic fact is crucial for any potential opposition. If there were a real opposition force within the UFT to challenge Unity, the UFT would not be taking the positions it has. What should the organizing priorities of union activists be right now? What are some basic points of unity that bring us together? What strategies and tactics can achieve the change we want to see? What is a union caucus? How could one be democratically structured to include the diverse political and pedagogical views among our membership? How can our rank and file chapters be more organized? I can't tell you how many conversations I've been having with people who are coming up with one idea after another on how to fight back against the ed deform agenda of closing schools, pushing charters, vilifying teachers, and so on: boycotts, petitions, protests, rallies, marches, conferences, political campaigns, etc. But I always point out one very important missing ingredient: there is not an organization in existence that is capable of coordinating these actions in a consistent way. Oh, wait! There is such an organization. It is called the UFT. Only one problem. The UFT leadership has no real interest in truly fighting ed deform other than as much of a holding action as they can get away with. The UFT/Unity leadership's prime directive is to hold onto power at any cost. I can't say this enough times. But of course, the UFT while cooperating with a sham evaluation scheme only did the former. And lost. Instead of fighting the right fight, the UFT fought the wrong fight. Even if they would have lost the battle anyway, by taking a stand with some integrity, they would have won. But this is the case with every story. I can say a lot more about how the UFT operates but will have to leave that for another time. What I am trying to say to all my activist friends and fellow bloggers and to anyone who might read Ed Notes is that with all your activity and suggested activity the overriding prime directive is to turn the UFT into a body that will truly engage in the struggles and really function as a coordinating force to put an end to the madness. Then there are those who think the UFT leadership can be pressured or convinced. "Oh, if only I can talk to Michael," I hear. Then there is the "pressure from below" people. "Let's get the UFT leadership on board." Right. Wait till you see my video of how the UFT leaders functioned at the Feb. 8 PEP. When any action gets going at the school level, the UFT sends in people ostensibly to help, but really to deflect and undermine any real initiative they might deem a threat to their prime directive. And rank and file teachers taking action is such a threat. The time has come after years of failed attempts by groups such as TJC and ICE to put together a dynamic, far reaching organization within the UFT --- call it a caucus if you will, which some people only define as a group that runs in elections. I'm thinking beyond that narrow framework since I full well know Unity has stacked the election deck to make it impossible to win an election against them. But I point out that in Egypt they couldn't win an election. An organized force within the UFT would have to organize from the bottom up -- school by school and create a shadow UFT district by district. This will take a large force of people committed to working on such a project as organizers. Right now knowing the landscape, if there were a hundred activists involved moving in concert the UFT would be shaken to its core. (Up to now the reality has been that no group ever had more than a dozen very active people at one time.) While a hundred organizers who work to build the organization (don't confuse that with people who just attend a meeting or sign up to join) is still a drop in the bucket, in NYC there would have to be 300-500 such people. That is not an easy task but not impossible. If such an organization does come into existence, it would have to be the anti-Unity in the sense of bending over backwards to be democratic -- not just for the idea of democracy but because I believe democratic discourse leads to better decision making -- if the UFT was actually democratic there would have been a real fight against ed deform instead of so many compromises. In fact the UFT had the ability to derail much of the Bloomberg program if it has used all its resources to do so. But Bloomberg knew the union could be bribed by offering money in the form of raises, much of it disguised by the longer day which is not a raise. Well we are at a point where such an organization is possible and everyone has a chance to get in on the ground floor in terms of shaping the nature of such an org. Right now it is going by a temporary name of State of the Union. After attracting over 200 people on Feb. 4 where workshops were offered and a sense of testing the waters as to whether there was serious interests beyond the usual suspects in forming such a group. The stage has been reached to engage in serious discussions on how such an org with people from NYCORE, GEM, ICE, TJC, Teachers Unite, ISO, GEMATRa, ODOE, other ad hoc groups and non-affiliated people can come together in a democratic manner to create a structure that could work. So, no matter how many ideas you have for action or how you rail against the UFT leaders or the ed deformers, the prime directive for critics of the UFT leadership is to put the major effort into building a coherent organized force. Who knows? When faced with a real opposition that gathers support from the schools, even Unity Caucus may not find it so easy to direct the rank and file teachers into total oblivion. I'm heading off for the last planning meeting this afternoon for the SOTU Part II this Saturday. I've been involved from the beginning discussions over a year and a half ago and have tried to apply what I learned from working with ICE, both positive and negative plus from the continuing work with GEM fighting for public education. ICE, which still holds the deepest discussions of any group I've worked with, will continue to work to share information with fellow educators through discussion groups and the internet outreach. I still feel most comfortable in the ultra democracy of a group like ICE. But that model has not proven it can organize masses of teachers. Am I happy with everything? No. We can no longer can afford to be purists in the midst of this crisis. Hope to see you there. Or if not then at follow-up events. Flyer for distribution at your school: email normsco@gmail.com. Why do we need a new caucus? We believe our strength lies with our members, organized into strong chapters. This requires active effort to educate our membership about how their union works, and involve them in democratically determining its direction. We believe in social justice unionism. We fight for equitable public education and against racism in the schools. Building an alliance of students, parents and community members as a key part of our strategy. 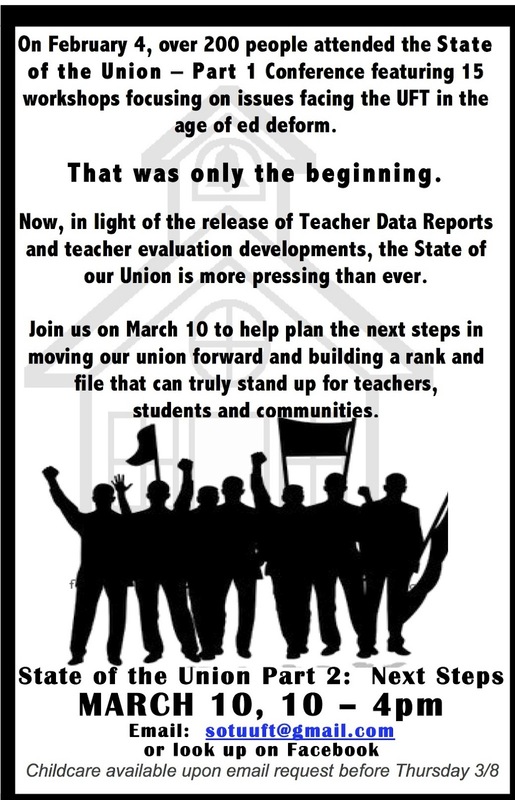 The UFT must fight for our members and our students. Our working conditions are our students learning conditions. We prioritize members working together to build power in our schools. Through collective struggles, our members will gain confidence and organization to mobilize an escalating series of actions, in our communities, city-wide and nationally, that can begin to take on the bigger challenges facing our union, educators and public education as a whole. Every educator in America knows that our profession, and our students, are under attack. The onslaught of high-stakes testing, privatization, weakening or elimination of job protections, school closings and charter co-locations threatens the very existence of public education as we know it. Unionized teachers in particular have been singled out for demonization. The strategy put forth by our union leadership to take on these challenges is inadequate. UFT officials rely primarily on lobbying, media blitzes and procedural law suits. When occasional mobilizations are called, they are organized without a long-term plan for escalating actions or increased membership involvement. The union leadership takes a concessionary stance in order to maintain its "seat at the table” with politicians and corporate forces like Bill Gates, who turn around and attack teachers and the union at every opportunity. Union leadership then sells serious concessions to the members as victories claiming - "It could have worse”. See Norms Notes for a variety of articles of interest: http://normsnotes2.blogspot.com/. And make sure to check out the side panel on the right for important bits. UFT misses a golden "data driven" opportunity; eh, why are we paying almost $1200/yr dues? Just like all of you i'm bounced from (in my case bklyn mini hs) every week.